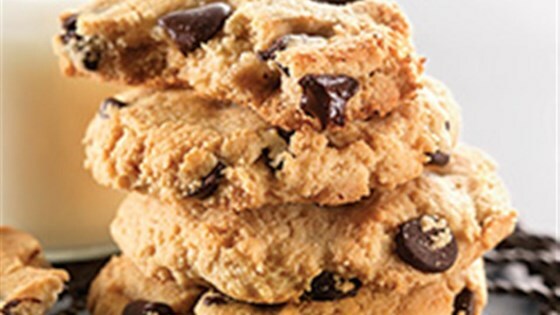 "Almond flour is the secret ingredient in these crisp and tender chocolate chip cookies. For chewiest cookies, enjoy these warm from the oven. If you prefer them a bit crisp, wait until they've cooled before biting into one (or several). Store any remaining cookies at room temperature - a cookie jar keeps them handy!" Preheat the oven to 350 degrees F. Lightly grease a baking sheet, or line it with parchment. Combine the brown sugar, baking soda, salt, and butter, and mix until smooth. Mix in the vanilla, egg, and almond flour, stirring to combine. Scrape the bottom and sides of the bowl, then mix for 1 minute at medium speed. Scoop the dough one level tablespoon at a time onto the prepared baking sheet; a tablespoon cookie scoop works well here. Gently flatten the cookies to about 3/8-inch thick. Bake the cookies for 9 to 12 minutes, until golden brown. Remove the cookies from the oven. Allow them to cool on the pan for 2 minutes, then carefully transfer them to a rack to cool completely. Only change I made was coconut oil instead of butter. These came out perfect! Very good cookie feel, not too sweet, but simply delicious. Great recipe. Also works just fine if you don't have almond flour and just grind a few cups of almonds in a vitamix. Did not miss the flour at all. The recipe works great as gluten free. I substituted 1 tablespoon coconut oil for the butter and carob chips for the chocolate chips to make it dairy free as well.